Ok. First and foremost, I'm not a cook or a baker. I just love to try new things and explore my teeny/weeny/trying/hard/creative mind. Let me get straight to the whole process and how I turned an egg and toast into a heavenly breakfast meal. (Bias with the taste, I made it eh!) haha. 1. Crack the egg. Separate the egg yolk from the white. 2. Don't forget to fry the egg yolk first (not too long)!! 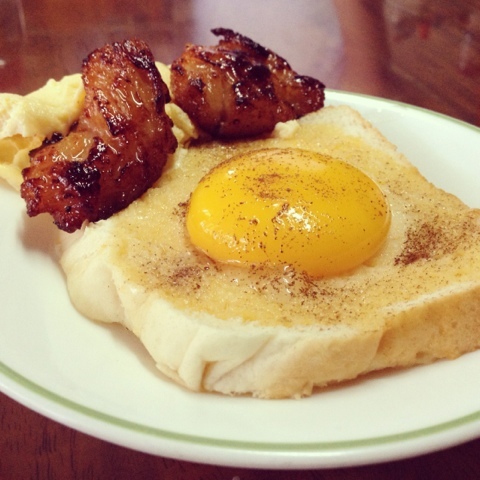 :) Place the yolk in the middle of the bread. 3. Sprinkle some cinnamon all over while frying. A pinch would do. Add a little salt to taste. 4. Toast the bread in a toaster for about 2-3 minutes until the bread becomes darker. 5. While toasting the bread, cook the packed tocino in a medium heat pan. You can fry it in water or in a cooking oil. Whichever is great! This is my finish product, what do you think? :) ENJOY!